How do we define effort in sports? How do we measure accountability? How do promote and encourage and teach all the key intangibles that make sports so fascinating? Just ask my favourite coach. He’s back and this time he’s making things easier than ever for me. For Geno Auriemma, the Head Coach of the University of Connecticut’s Women’s Varsity Basketball team, when it comes to questions about effort, the answer rests with the players. So let’s just ask them. The exercise is simple enough. Coach Geno asks his players to run to the end of the gym and back. Then he watches the run, shrugs, and asks for a second run. Only this time, he tells the players he’ll give them $100 if they make the run in under ten seconds. You have to actually show them the hundred dollar bill for it to work, too. And every time he does it, he hollers “ten!” just as they’re about to cross the finish line. Frustrated, the players always ask for the reasons behind the mischievous little drill, and this is what he tells them. Ok, so it’s a bit of a brainwash. Sure, players are going to be able to work hard or find a new level when there’s something on the line. But what the exercise will show players is what they’re capable of when the price is right. 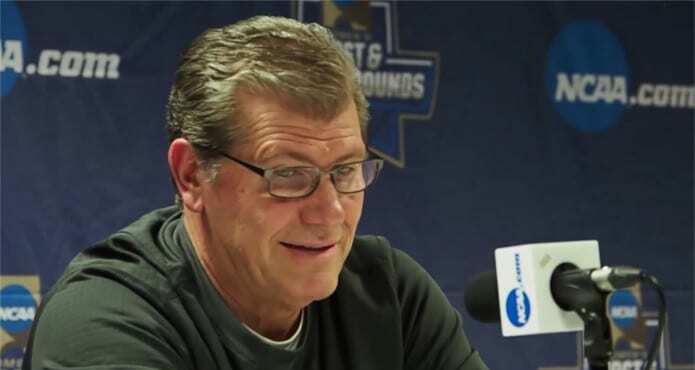 Geno Auriemma measures effort in his players by their own barometer. He’s got a level of expectations of each of his players, but there’s no sense in constantly barking orders or hollering at players to pick up their pace. No, for coach Geno, he’d rather them understand their own motivations for working hard. Then he’ll teach his players the real reasons they should be leaving it all out on the court. Money has nothing to do with it, but try telling that to a 20 year-old college student even if they are receiving a scholarship or some other sort of financial aid. What do you think? Diabolical? Genius? Devious? Got any of these sorta tricks of your own?